Mark and his mom stayed a night with us Friday night, and I got the chance to ask him a few questions about his marathon running career. Mark’s dad Norman passed away last year in San Diego after a battle with prostate cancer. Until then, both his parents went to cheer him on at every marathon he ran, and his mom Dorene has continued to do so. She even followed him around in Tokyo where it was below freezing and hailing on race day. In honor of his dad, Mark has run all six marathons for cancer charities. “I think what’s motivated me is being able to do something that not everyone can, but people want to do. There’s a lot of people I run my marathons for; I’ve run all six of them for a cancer charity, the last three have been in honor of my father, and I like running and raising awareness for people who can’t necessarily run or raise awareness for themselves,” Goldfinger said. Mark ran in his hometown marathon, New York in 2013. “So far, the New York City marathon in 2013 has been my favorite. It was my first marathon; the crowds were nonstop the entire 26.2 miles; my dad, my mom, my friends, and my family were all there, and it was really the marathon that gave me the inspiration to continue running,” Goldfinger said. Boston was his 5th of the Abbott World Major Marathons in 2 years. After New York, he continued his running career, running the London Marathon and the Berlin Marathon, which were just 5 months apart in 2017. In London, ESPN featured him in a documentary. He set his personal best in Berlin. After his dad’s passing in 2018, he ran in Chicago, Tokyo, and lastly Boston to complete his six stars. Mark told me later on that the reason he wanted to finish in Boston was because of its history as one of the world’s most prestigious marathons. On Saturday, we went with Mark and Dorene to the Boston Marathon Expo where runners could pick up their bibs prior to the race. Mark told me that things start to feel real for him when he picks up his number for the race. But before he was able to receive his bib, we had to pass through an airport-like security checkpoint with a metal detector. This reminded me of the reason this security was added: the Boston Marathon Bombings of 2013. Last year, I wrote an experiential essay about how I learned the true meaning of Boston Strong. I had never been to this expo before, so this was a unique experience for me. I was able to see where runners picked up their numbers and explore the various marathon-related booths and displays. I learned a little more about the Abbott World Marathon Majors, bought a Dunkin Donuts Boston Marathon t-shirt, and took pictures with Mark and the rest of the family at a press photo station. As per Mark’s request, we cheered him on from the midway point in Wellesley. Mark is the first Six Star Finisher that I know, and he is very important to me. Not only is he my godfather, but his dad Norman was my mom’s godfather. This is the sign we made for Mark and held up when he ran by us in Wellesley. We were able to track Mark on the official Boston Marathon app. We had plans to give him high fives when he passed by, so we tried to figure out exactly when he would arrive. We held up our sign when the tracker said he was close so he could find us. Mark was running with his friend Danny Elphinston, who has run all six of the Abbott World Marathon Majors with Mark and received his Six Star medal with Mark. Though Mark and Danny passed by quickly and we barely had time to say hello, it was pretty cool to watch my godfather run the Boston Marathon live. We watched him right in between Miles 14 and 15. Soon after seeing us, he would go on to face Heartbreak Hill, the hardest part of the Boston Marathon. For most of the marathon, Mark was running 8-minute miles. On Heartbreak Hill, Mark was forced to slow down to about a 10-minute mile. In the meantime, the elite runners finished the race. Kenyan Lawrence Cherono led the males, just 1 second ahead of 2nd place in the closest finish since 1988. Ethiopian Worknesh Degefa led the females. Though we did not see Mark cross the finish line live, we did catch him on a livestream and I got the chance to talk to him after he finished. I have the Celtics taking down the Warriors in a 7-game series. But how will they get there? I think Boston should easily take down the Pacers. With Victor Oladipo out of the picture, I cannot see Indiana doing much in these playoffs. Kyrie Irving ruined the Celtics’ chemistry during the regular season, but I don’t think this will be as apparent in the playoffs, where the whole team will be motivated and willing to do whatever it takes to win it all. The Pistons may have Blake Griffin and Andre Drummond to lead them, but that won’t be enough to pull off a series upset over Giannis Antetokounmpo and a powerful Milwaukee Bucks team. However, the Celtics have multiple star players on their roster who will outplay Greek Freak’s teammates and help Boston win in the Eastern Conference semifinals. I can’t see anyone getting in Toronto’s way until they face the Celtics. The Raptors are by far the strongest team in their quadrant of the bracket, led offensively by Kyle Lowry and defensively by Kawhi Leonard. But I do see Boston riding the momentum and overcoming adversity as they take down Toronto. Their roster is stacked, so if the Celtics are on the same page motivation-wise and get off to a strong start (as I see them doing against Indiana), they could be a threat to Golden State. The Warriors should not have a hard time with Western Conference opponents though. Besides Boston, the Warriors are the only team I have sweeping their first round opponent. The Rockets won’t be as easy an opponent as the Clippers, but a healthy Stephen Curry and Kevin Durant will outplay James Harden and Chris Paul. I could see the Thunder, KD’s old team, making a run as well. Portland is known for playoff choking, and Denver’s lack of experience could come back to haunt them. I think they should be able to handle the San Antonio Spurs, but the Thunder might be a bit much for an inexperienced team like the Nuggets. Golden State, however, will end Oklahoma City’s run. With Marcus Smart back and the team united by a common goal, the Celtics should have a chance at Golden State and I’m staying optimistic with this bracket. I’m sick of Golden State winning, and it would make it even better if the Celtics could be the team to finally beat them. As long as Kyrie Irving’s selfish ways don’t come back to haunt them, the Celtics should have a chance. That’s all for my playoff predictions this year. Stay tuned for more Celtics playoff coverage soon. Yesterday was World Autism Awareness Day. As you may know if you have read this blog before, I was diagnosed with autism at the age of 2. Doctors said I may never speak. But almost 14 years later, not only am I talking, I am a budding sports journalist who has written this blog for 5 years. In honor of Autism Awareness Day, the Boston Herald asked me to tell my story for today’s paper! I met Joe Sciacca, the editor-in-chief of the Boston Herald at a Red Sox game in 2015. Since that day, I have gained multiple exciting sportscasting experiences from the Herald, including guest co-hosting a Boston Herald Radio show. For Michael Palmer, running the Boston Marathon to raise funds for the Doug Flutie, Jr Foundation for Autism has personal meaning. Michael has Aspergers. He wants to spread the message that people on the autism spectrum are not alone in their daily struggles to connect with others. Michael literally spread his wings in creating a “snow angel challenge” as part of his marathon efforts. Michael put out the challenge for people to overcome their fears and barriers and support people like him who overcome challenges daily. I can relate to Michael’s challenges and I am grateful for his efforts, as they benefit me as well. I’m Flutie Fellow Andrew Roberts, and thanks in part to Michael’s efforts, the Flutie Foundation is helping me pursue my goal of being a sports broadcaster. Michael’s “snow angel challenge” spread through other team members and friends of the Flutie Foundation. Then, recently-retired All-Pro New England Patriots tight end Rob Gronkowski got word of the challenge. While he didn’t jump in the snow, Gronkowski did participate in his own way. Thanks Gronk! If you’d like to support Michael Palmer’s efforts to raise funds and awareness for autism, please check out the Flutie Foundation website at FlutieFoundation.org. This is not the last of my Boston Marathon coverage. I will be writing more runner spotlights this year, including one about a runner for Get Air Sports, a partner of the Flutie Foundation. On a side note the Pats need a replacement for Rob Gronkowski who had fun in contributing the video for Michael. Will they address the TE position in the draft? Find out what I think in my upcoming 2019 NFL Mock Draft. Stay tuned for more sports coverage soon. But as the Herald headline noted, my sportswriting journey is only just getting started. I understand, this a little late, as Opening Day was Thursday, and the Red Sox didn’t look so great Thursday even though they are a part of this Top 6. But I figured I’d finish this series since there’s only one article left. The Cardinals haven’t made the playoffs in a few years, sure. But the veterans they kept around from their last playoff run, like Matt Carpenter, Adam Wainwright, and Yadier Molina, are still reliable contributors. They have also boosted the team with younger talent, including SP Jack Flaherty, OFs Harrison Bader and UT Jose Martinez, and SS Paul DeJong. After adding star in Goldy, the Cardinals have the tools they need for contention. But how far can they go in such a tough division? They will have to get past their division rivals that are also contending, the Cubs and Brewers. The Cards’ rotation looks alright and its young core will keep the rotation elite for a long time. But right now they lack an ace. I don’t believe they can be a World Series contender without one. Whether they need a trade to find an ace or someone steps up as time passes, this could hold them back from serious contention and should be priority #1 for GM Steve Keim. Maybe Martinez could be a good trade piece now that 1B Paul Goldschmidt is on board. The defending World Series champions had a relatively quiet off-season. They did retain most of the team from 2018 that won 108 games. But the bullpen has been their biggest issue, even with Craig Kimbrel. Without Craig Kimbrel, there is even more pressure on the rotation to succeed. This is especially true regarding Chris Sale and David Price. After Sale’s extension, both will be expected to to shine every start in order to be worth the money. Each start costs about $1 million dollars. Regardless of this pressure, the Red Sox should at least secure a Wild Card spot if they can’t beat out the Yankees in the AL East. They are still one of several powerhouses in the league. With Craig Kimbrel on the way out, the closer role is up for grabs. But if you look at the active pitchers on the roster, it’s hard to imagine any of them as a consistent closer. If the Red Sox wanted to repeat, they would’ve invested more in this bullpen rather than focusing so much on the rotation. They need to add a closer unless Matt Barnes, Ryan Brasier, or someone else steps up soon. The Braves’ rebuild began to pay off last season as their younger players broke through. This off-season seemed quiet, but they filled a gaping hole at third by adding Josh Donaldson. They also brought back OF Nick Markakis, and they have reportedly been targeting a reunion with CL Craig Kimbrel. This small series of moves could make a big difference in Atlanta. These moves, alongside development of OF Ronald Acuna Jr. and 2B Ozzie Albies among other should transform the Braves from solely a division contender into a World Series contender. The Braves are my World Series winner this year. I expect 1B Freddie Freeman, Albies, Donaldson, and others to combine to make for one of the best lineups in the league. Health is definitely a concern, especially considering the fact that Atlanta will start the 2019 season with two starting pitchers on the IL. Donaldson is also injury prone, and if he goes down, Johan Camargo is the next best option at third base. I don’t trust Camargo as a starter. If the team stays healthy in the long run, they could be serious contenders. Otherwise, they could be in a bit of trouble. The Cubs may have been quiet this off-season, but a healthy Yu Darvish will boost the rotation, the bullpen has plenty of depth despite questions at closer, and the lineup is looking pretty solid. Their decision to move Javier Baez to shortstop full time and put Ben Zobrist at second is very smart, as SS Addison Russell was inconsistent and had some character issues. The Cubs have dominated in the National League ever since their World Series winning year in 2016, but with a health a concern and the division getting tougher, will the Cubs be able to keep up the good work? The Cubs were unable to do much this off-season, and they could have used another outfielder. LF Kyle Schwarber and RF Jason Heyward are viable starters, but they are very streaky and inconsistent. Albert Almora Jr. is the best option in center field. Chicago should have added another center fielder to start over Almora some days and fill in for Heyward and Schwarber during slumps. After pairing new slugger Aaron Judge with Giancarlo Stanton, the Yankees underperformed in 2018. Yes, they made the playoffs and won 100 games. But they were overshadowed and eliminated by their bitter rival, the Boston Red Sox. This year, the Red Sox will be without their star closer, while the Yankees fixed up a problematic rotation and built one of the most stacked bullpens in history. This will allow the Yankees to propel past the Red Sox and win the AL East. But in Boston and New York, it’s all about championships, and the Yankees aren’t will have to work for a World Series victory, even with the stacked roster. The Yanks have some nice pieces in their infield. But if Troy Tulowitzki and Greg Bird fail to stay healthy, they are left with D.J. LeMahieu as their best infielder. Gleyber Torres and Miguel Andujar have not reached their prime yet, and Luke Voit must still prove that 2018 was not a fluke. So I’m a bit concerned in terms of infield depth for the Yankees. The Astros are two years removed from their World Series victory, a result of a 5-year rebuild that made the Astros one of the MLB’s worst for a good 2-3 year span. Now, the Astros are still one of the league’s elite teams, but they lost some of their starting rotation depth this off-season, forcing two starter-turned-relievers back into the rotation. They did bring in OF Michael Brantley and UT Aledmys Diaz, filling the hole UT Marwin Gonzalez left. Though Houston took a slight step back this off-season, I still have them as my AL West winners and the team with the best regular season record. Considering the young core they have put together in the last several years, they should be elite for a long, long, time now. Evan Gattis is no longer on the team, which means Tyler White must be trusted as Houston’s regular DH. This could be a prove-it situation for White, but if White struggles, what then? They could bring Gattis back, or they could just put Diaz back there. They could even call up Kyle Tucker to play DH. This one’s an easy fix, just something to keep an eye on. That’s all for this year’s preseason MLB power rankings. Come back at the end of April for my first 2019 set of monthly power rankings. 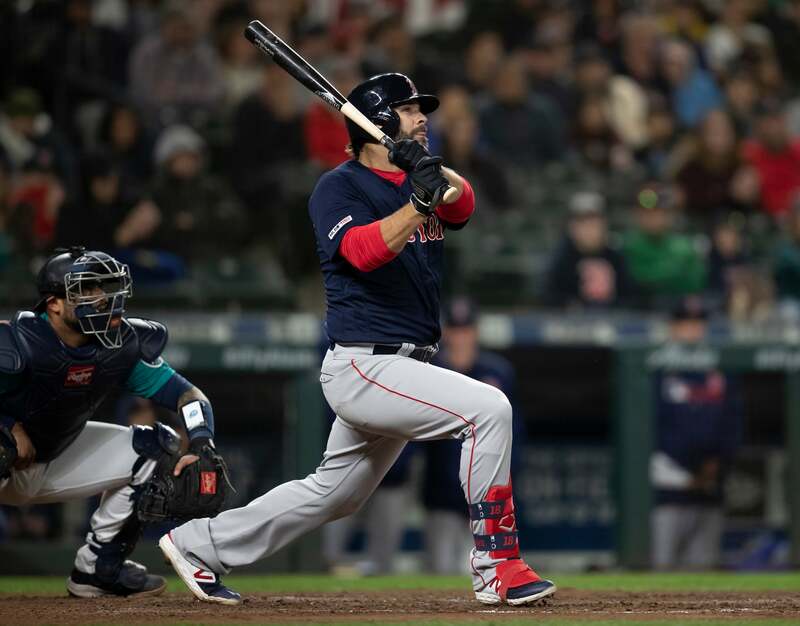 It was the top of the 9th inning, and Mitch Moreland had come in to pinch-hit for the Red Sox with runners on first and second. After taking 2 balls, Moreland nailed a 95 MPH fastball up the middle into right field for a line drive go-ahead homer! The Red Sox had taken a 7-6 lead over Seattle! 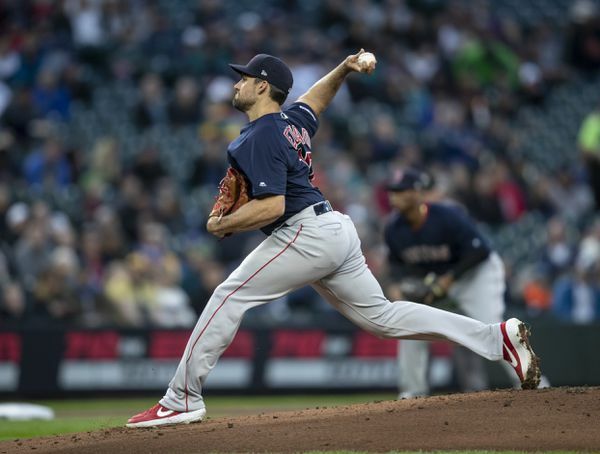 Matt Barnes finished the job with a 12-pitch, 2-strikeout bottom of the 9th and the Red Sox had won the game. The Sox came back to defeat the Mariners last night despite trailing 6-1 after four innings. Even after an impressive run with the Red Sox last season, Nathan Eovaldi struggled mightily in this game, giving up all six runs, three of which were scored on solo homers. As a team, the Red Sox have given up 7 home runs in just 2 games. This could become a lingering issue that comes back to haunt them. Or it could just be a result of pitching against a powerful Mariners lineup. Eovaldi gave up solo shots to both Mallex Smith and Domingo Santana in the 1st inning. Smith and Santana are new additions to a young outfield, and neither has a history of hitting lots of dingers, but both of them knocked one out of T-Mobile Park last night. He went on to give up another one in the 2nd inning, this time to C Omar Narvaez, who’s never even been that big a contributor at the plate. If this didn’t wear out Eovaldi enough, the 3rd and 4th innings were even worse. In the 3rd, Eovaldi did give up a single and walk a batter making it men on first and second. Luckily, no runs scored here. But in the 4th, the Mariners put up three runs, two of which came on sacrifice flies. SS Tim Beckham began the inning with a double into right field, and Narvaez hit a line single to make it first and third with no outs. 3B Ryon Healy drove in the first run with a long double into deep center, and sacrifice flies by 2B Dee Gordon and Smith made it 6-1 Seattle just like that. The Red Sox didn’t do much of anything in these first four innings, but their first run was scored by a huge Xander Bogaerts home run into deep left field in the 2nd inning. In the 5th, the Sox had runners on first and third after an error and a Sam Travis single. CF Jackie Bradley Jr. was up. He may have grounded into a double play, but a run still scored. J.D. Martinez added a third run with his 6th inning solo shot into dead center. Eovaldi was replaced in the bottom of the 6th by Colten Brewer. Brewer may have walked some batters, but he didn’t give up any more runs. Christian Vazquez added a solo shot of his own in the top of the 8th, making it a 2 run game. After the homer, LF Andrew Benintendi and Bogaerts walked and RF Mookie Betts hit a ground single, loading the bases with 1 out. But 2B Eduardo Nunez grounded into a double play to end the inning. Though the Red Sox failed to take the lead in the 8th, Brian Johnson came in and struck out the side. After that, Moreland hit his homer, Barnes finished the job, and the Red Sox had won 7-6. Tonight’s 9PM game, the third of four against Seattle may answer some of our questions that have arised during the first two games. Is the rotation a concern? Is Matt Barnes our everyday closer? Watch tonight to find out. Baseball Bits #12: Can Sox Repeat like Few Teams have? Welcome to my annual preseason Baseball Bits article! If you were unaware, today marks 5 years since I started my Boston Sports Mania blog! The Red Sox were just about to begin their regular season when I started, and just like this year, they were coming off a World Series victory. On my first day, I posted an article titled “MLB 2014 Preview”, which included my predictions for the 2014 MLB season. I still write these prediction articles every year, including this year. I started this blog to write about my favorite sports like baseball, which is what today’s post is about. In 2018 the Red Sox became the 16th team in the 162-game era to win over 100 regular season games and then go on to win the World Series. They were led by new manager Alex Cora and a new star in J.D. Martinez. But what most Boston sports fans are wondering about now is how the Red Sox will do in 2019 and whether they will repeat. I did some research on 100+ win World Series winners in the 162-game era and how they did in their next season below. Based on the research, I believe the Red Sox have a 20 to 25% chance to repeat. I believe that there is still a select group of elite teams that could win the World Series this year. World Series repeats are less common during the 162-game era as just 9 of 56 (16%) World Series winners repeated. However, 4 of those teams were 100-win teams. World Series winners who did not reach 100 wins in this time frame only repeated 12.1% of the time since 1961. That’s more like a 1 in 8 chance. 100-win World Series winners have repeated 26.67% of the time during the same time frame. I think the significance of being a 100-win team helps improve the Sox chances to repeat. However, as much as I hate to admit it as a huge Boston fan, I am sticking with my prediction that the Sox will fail to reverse the trend of World Series winners. I think they will lose in the ALCS to either the New York Yankees or Houston Astros. The odds are stacked against the Sox reaching 100 wins as well since only 4 of the 15 100-win World Series winners even reached 100 wins again the next year. I don’t think the Red Sox will reach the century mark but will come close at somewhere between 92 and 96 games. A bullpen with no proven closer to start the season helps support my prediction A World Series repeat is unlikely to happen, though you shouldn’t rule it out yet. Alex Cora did wonders for this team last year, so maybe he’ll be able to recreate the magic of 2018. If he can, there’s no reason why he shouldn’t be 2019 AL Manager of the Year. That’s all for today’s Baseball Bits. After all I have accomplished in the last 5 years, I look forward to creating even better content over the next 5 years. Stay tuned for more soon, including the next portion of my MLB Preseason Power Rankings. If you’ve been following any kind of MLB off-season news, you’ve probably heard plenty about Harper, so I’ll keep this brief. The Nationals could still be in it to re-sign the 26-year old Harper after a strong start to his career in Washington. But the Phillies appear to be the current front runners. The latest rumors suggest that the Phillies are in Vegas with Harper and may have a deal done by Monday. But earlier this week, we heard the same thing about Friday, and it didn’t end up happening. Will Harper end up in Philly, or will a mystery team swoop in before the Phillies finalize things? I’ve heard things suggesting that the Giants aren’t up to offer a $300 million contract to Harper. But now that they are reportedly willing to offer a long-term deal, they could change their mind considering the mutual interest between Harper and San Fran. If the Giants came close to Philly’s offer, maybe Harper would sign there out of impatience. Plus, the Phillies are division rivals of the Nats, and the west coast is closer to Harper’s hometown. Kimbrel’s agent made it clear that although Kimbrel has been stubborn about his contract, he will pitch in 2019. But with the late inning relief market already settling down, where does Kimbrel fit? Sure, he could re-sign with Atlanta. But you cannot discount Arodys Vizcaino as a closing option for the Braves. Kimbrel will eventually have to settle for a smaller contract, and if there’s any team who could still use relief help, it’s Boston. The Red Sox have been adamant about finding a closer internally. Who knows, Jenrry Mejia or Tyler Thornburg could bounce back. Matt Barnes could step it up. But I think the Red Sox will end up bringing back Kimbrel as a safety net once his price goes down. Barnes, Mejia, Thornburg, and others can set up Kimbrel. Keuchel, like Harper, is a Scott Boras client, and Boras clients have tended to sign late into the off-season, so it’s not a huge surprise that Keuchel is still on the market. But unlike the relief market, there is still a handful of teams that could use starting pitching help. The Phillies, Braves, and Padres have been linked to Keuchel, but the Padres just signed Machado, and the Phillies aren’t going to turn attention to Keuchel unless they lose out on Harper. The Braves would be smarter to sign a lower-tier starter considering their surplus of SP prospects on the verge of a major league career. I see the Padres finding a cheaper option and a surprise team signing Kimbrel. The Blue Jays may have a decent rotation going with Marcus Stroman, Aaron Sanchez, Matt Shoemaker, Clayton Richard, and Ryan Borucki. But they lack a true ace, and could use depth in case Borucki turns out to be a bust or Shoemaker and Richard are inconsistent or get hurt. Keuchel could help Toronto kill two birds with one stone. Why sign a top line starter with so many prospects about to crack the majors? Well, Toronto’s rebuild is a unique situation. With this legendary group of prospects, Toronto’s a pitcher or two away from contending during a rebuild. When people think about all the quality players still on the FA market, they think Harper, Kimbrel, and Keuchel. But what about Adam Jones, who slashed .281/.313/.419 with 15 dingers despite a down year? Back in 2017, he put up a .787 OPS with 26 home runs. Though he is getting up there in age, I think he still has potential to succeed for the next few years to come. But where? He will likely end up with a team that needs OF help but cannot afford Harper. Maybe a small market team that hasn’t spent much this off-season could be a fit. The Indians spent a lot in 2016 and 2017, but after cheaping up by trading away Yonder Alonso and Edwin Encarnacion, they may have room for the outfield centerpiece they need. Jones would allow Bradley Zimmer, Leonys Martin, Tyler Naquin, Greg Allen, and Jordan Luplow to split time among the remaining two outfield spots. I don’t see any of them as full time starters, so this is a good depth signing. Maybe trading away one of their lower-end outfielders after could be a smart move. That way, the Indians will have less crowding and more talent. Gonzalez is a cheaper SP option that teams who cannot afford Keuchel may go after. Gonzalez had a strong year in 2018, making the case for a decent sized contract. But he hasn’t received much interest from teams besides the Brewers, who traded for him at the deadline. Who will end up signing him? The Padres aren’t going to want to invest in Keuchel after signing Machado. So I think it’s more likely that they save a few bucks and add Gonzalez. You could make an argument that the entire Padres rotation is wide open. There is no pitcher on their current roster that I see as a surefire starter. But Gonzalez will provide the Padres with the rotation stability they need, with the help of another low-tier free agent starter or two. That’s all for today. Stay tuned for MLB predictions once Harper finally makes his decision.